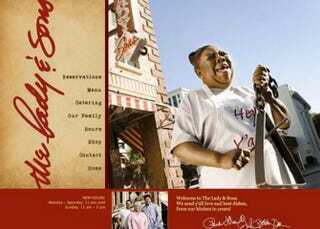 Paula Deen is back in the controversial spotlight, and it's because of an image featured on her website for the Lady & Sons, a restaurant in Savannah, Ga. A Facebook group called For Black Women Only found an image on the site that it deemed to be modeled off the image of a mammy. "Paula Deen longs for the antebellum South when Blacks, especially black women, were nonthreatening servants," the group wrote on its page. It also recommended that people "kill the mammy within" and stop associating with Deen. According to Eater.com, the restaurant released a statement responding to the claims that the photo is racist. The restaurant stated that the photo isn't new and has been on the site for five years. "The lady featured in the picture has worked at the restaurant for over 17 years and is like family to the Deens." If you recall, during her deposition when she was sued for discrimination, Deen said she had many black people who were like family to her, but she still had no problem calling them the n-word. Deen, who is embarking on getting her career back on track, has been the poster child for redemption when it comes to apologizing for her past. Her most recent appearance on Steve Harvey's talk show shocked many people, especially after Harvey announced she would be mentoring 100 black boys at his mentoring camp. Whether or not the photo is racist probably depends on whom you ask. Maybe a better question would be, is it stereotypical of the portrayal of black women in the old-school South?